Annunciator Basic Setup and Configuration Overview – Welcome to the EMIT Technical Forum! There are a large number of annunciator setup screens, all accessed through the Annunciator Setup Pages (Pg. 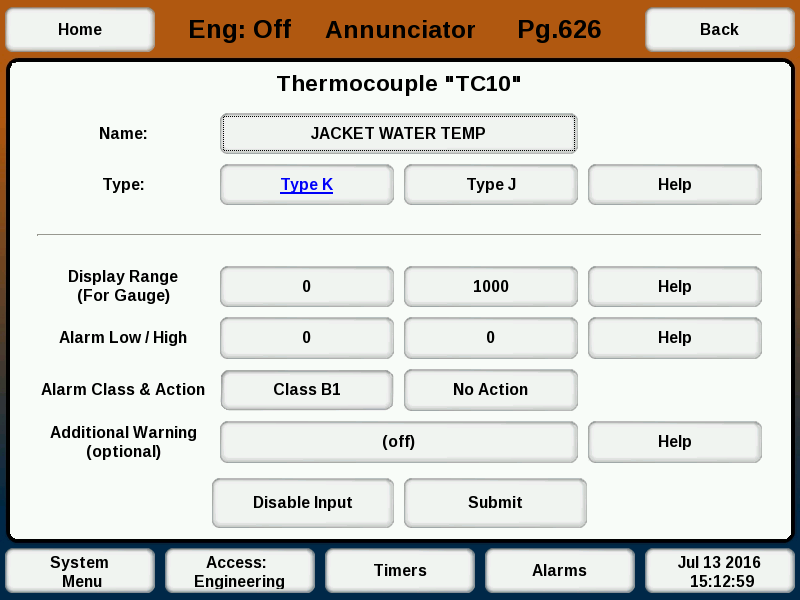 620) screen and its subpages, reached by selecting the “Annunciator Setup” button on the Annunciator Home screen. Subsequent sections of this part of the manual will describe the setup of individual parts of the system. The bulk of the setup items are under the subpage “Inputs Setup” or “Outputs Setup”. The basic four types of inputs (Analog, Digital, Thermocouple, and Magnetic Pickup) are setup through “Annunciator Setup” then “Inputs Setup”, or during the setup wizard. Details on the setup items of each is listed below. Value at (low) and (high): Enter the full range of the sensor. This should be printed on the sensor itself or can be found in the sensor documentation. Note: If an EMIT governor is on the system and pressure-based speed control is used, the suction/discharge sensors on the annunciator must use the units “PSI” or “KPA”. Alarm low and high: Enter the low and high alarm for the sensor. If either the low or high is not needed, it can be put at the limit or out of range of the sensor to keep it from ever faulting. Optional secondary warning: If an extra warning is desired, it can be added here. Display range: Choose the low and high display range for the input. This only limits how the gauges and graphs will be drawn, and does not have any effect on actual system operation. For example, one might want to have jacket water temperature use a range of 100-200 degrees, but postcat temp have a range of 300 to 1300 degrees. Alarm low/ high: Choose the low and high alarms if required. An unneeded limit can be set to zero to be disabled. Number of flywheel teeth: Enter the number of teeth expected on the MPU. Low/high alarm values: Enter limits as required. The low limit can be set to ”0” if not needed.